Stripped of its religious and family binding significance, Christmas has nevertheless become one of the most popular festivity imports in Japan in recent years. Japanese Christmas cake (no more than strawberry shortcake) now stands as the equivalent of the Christmas pudding and turron in the UK and Spain respectively. Whereas Christmas reunites families in the Christian world, here young couples take the occasion for a romantic outing to an expensive restaurant. Admittedly, Japan's winter holiday doesn't properly begin until the New Year, the so-called Oshogatsu festival, but this still shares some characteristics with the way that Christmas is lived in many countries. Thus, a visit to a local temple or staying at home with the family eating, drinking and watching TV are the main activities during this period. And just as the Christmas TV guide is filled with epic films with a historical and religious theme such as BEN-HUR or KING OF KINGS, The Story of Chushingura, also known as The Story of the 47 loyal Retainers, is a staple of Japanese TV channels throughout December and the New Year, rivalling in length with the Hollywood epics. Based on true events, Chushingura is one of the most popular and beloved tales in Japanese history, often described as a national epic, and seen as a tale of quintessential Japanese loyalty and endurance. The story of Chushingura took place in 1701 when Lord Naganori Asano, in charge of a reception of envoys from Kyoto, but unfamiliar with the protocol, sought the advice of the elder Lord Kira. On the day of the reception, at Edo Castle, Asano drew his sword and wounded Kira, his motives still unknown. The feudal regime or shogunate sentenced Asano to commit seppuku, confiscated his lands and disbanded his clan. Almost two years later, Kuranosuke Oishi, Asano's high ranking samurai, led a group of forty-seven Asano's retainers, now ronin or masterless samurai, broke into Kira's mansion and executed him. The shogunate, though sympathetic to the loyalty shown to their master by the ronin, a keystone of feudal Japan, sensed the threat that their rebellious action posed to their authority, and sentenced them to commit seppuku, a rather honorable punishment for their illegal action. First adapted for the bunraku, or puppet theater, in 1748 and soon converted to the kabuki form, it did not take too long after the arrival of cinema in Japan to be captured in film form (CHUSHINGURA GODANME, Chushingura's Fifth Scene, 1907) by director Ryo Konishi, starring kabuki actor Kataoka Nizaemon XI. 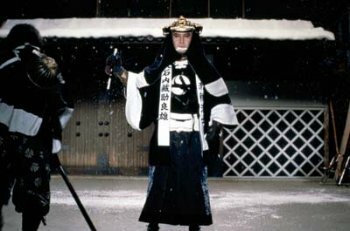 Chushingura saw over eighty film versions until 1962, but the pace has considerably slowed down since then, as only three more adaptations have been shot so far, the last two released on the same day, 22 November 1994, SHIJUSHICHININ NO SHIKAKU (The 47 Ronin), by Kon Ichikawa (1915-2008) and CHUSHINGURA GAIDEN KAIDAN (Crest of Betrayal), by Kinji Fukasaku (1930-2003), the latter a work that combined the legend of the forty-seven ronin and that of The Gost Story of Yotsuya. Kinji Fukasaku himself had also directed the other third version in almost 50 years under the title AKO-JO DANZETSU (The Fall of Ako Castle, 1978). TV adaptations have also been numerous, not less than thirty. Marking the 300th anniversary of the 47 ronin's deed, TV Tokyo aired on 2 January 2003 a 10-hour drama titled CHUSHINGURA:GETSUDAN NO TOKI. A year later TV Asahi (CHUSHINGURA, 10 October-13 December) and NHK (SAIGO NO CHUSHINGURA, 5 November-10 December), simultaneously broadcasted their own productions of this legendary tale of loyalty and revenge. The heavy concentration of Chushingura themes in December continued for decades since TV's first transmission in 1953. From that year until 1992, for example, over one thousand programmes related to Chushingura were shown, of which 52% were in the month of December (1). While it exists an extensive literature on Chushingura, the incident is generally overlooked in current books of Japanese history in English. Notwithstanding this omission, Chushingura still has a special place in the Japanese national consciousness, the old story of feudal loyalty, having being transformed to foster patriotic sentiments. Furthermore, the decision taken by the Tokugawa government is seen as an important step forward toward the formation of the modern state in Japan (2). The ronin were punished for not abiding by the Shogunate's ruling, remaining loyal to their master rather than the central government. A comparison can be made here to the gunfight at O.K. Corral. Portrayed in numerous films but only a footnote in history textbooks, it has nevertheless come to symbolize the struggle between law-and-order and the emergence of the nation. 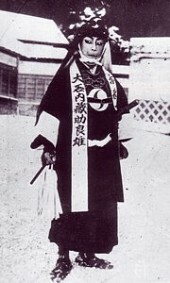 And just as the film versions of this American legend have favored the Earp faction, Wyatt Earp coming out as a hero, the takes on Chunshigura had constantly demonised, until 1982 NHK's Taiga drama TOUGE NO GUNZOU, the figure of Lord Kira and upheld that of Asano's, highlighting its youth and sincerity, regardless of his hot-heated and imprudent character. Chushingura will return to the big screen in which is to become Warner Bros. first Japanese production. Shoichiro Ikemiya's novel Saigo no Chushingura film adaptation, already done as a TV drama by NHK in 1994, shooting began in Kyoto on November 8 last year, its release planned for, perhaps December, 2011. It is directed by Shigemichi Sugita and features actors Koji Yakusho and Koichi Sato in the lead roles (3).